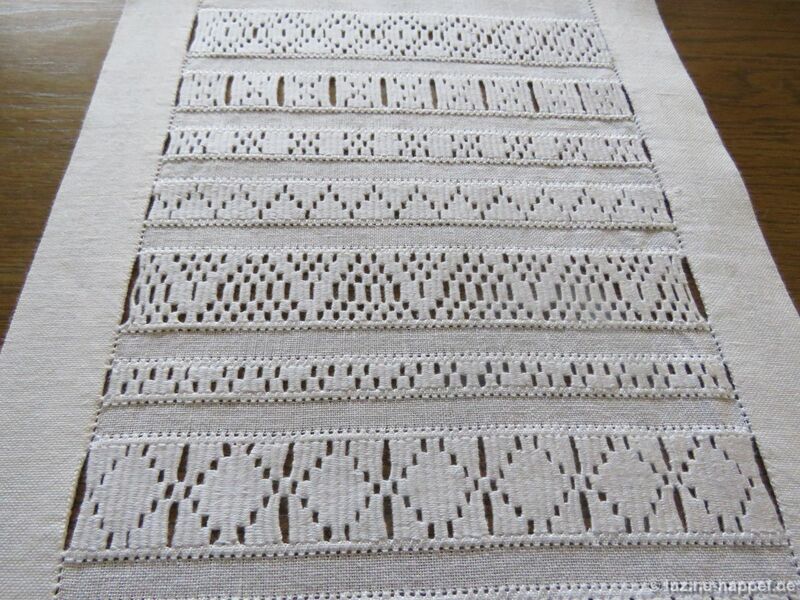 While preparing to teach this summer, I worked a sampler consisting of thirty-one different needle-weaving bands with very different patterns. My students thought it gorgeous. 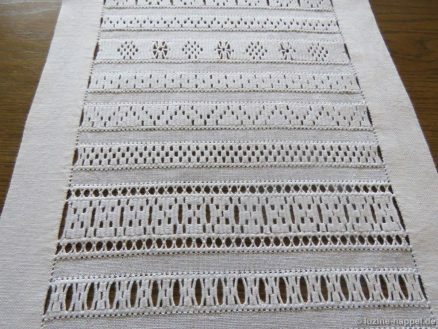 The picture below shows the entire sampler. 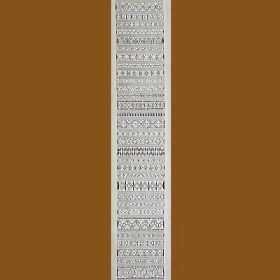 Because I cannot show overly long pictures on my blog, I sized a picture of the entire sampler to internet standards to give you a visual of the length to width ratio. The finished piece, hemmed and laundered, measures 28 cm X 170 cm! 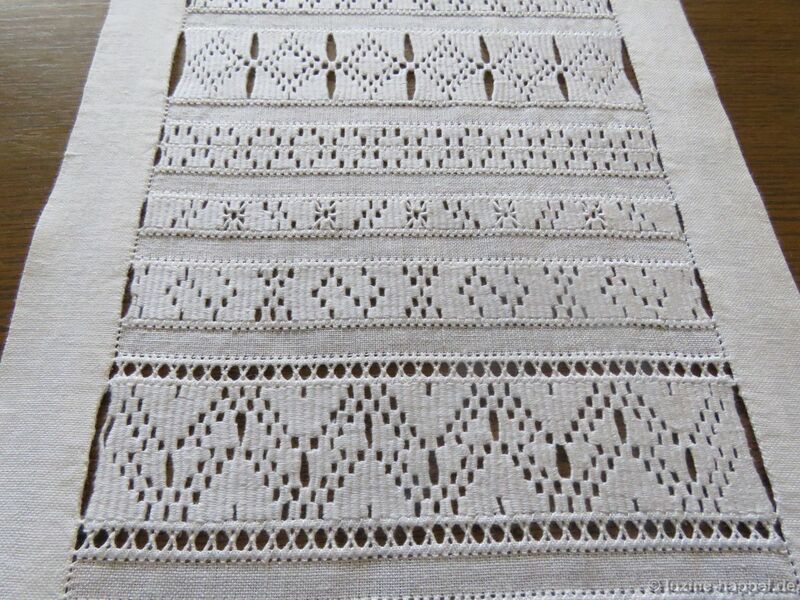 This sampler was worked on Weddigen linen with 13.5 threads per centimeter. 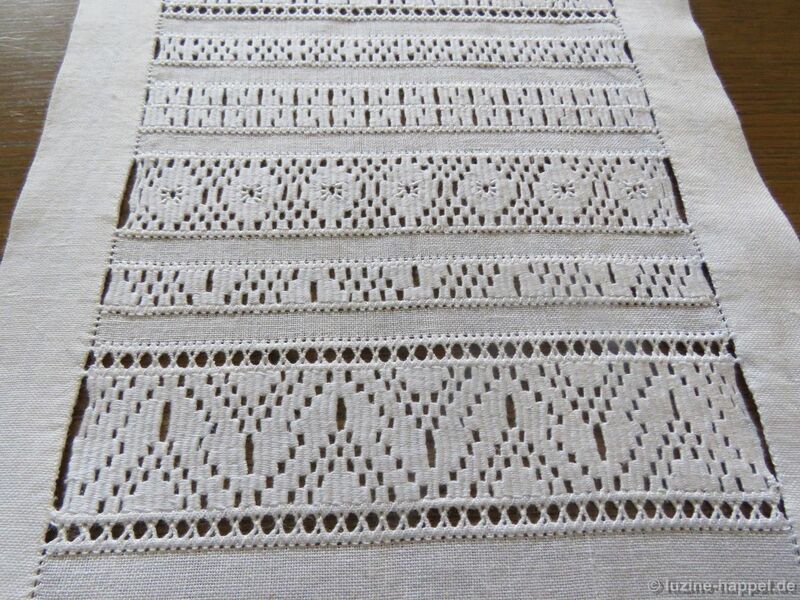 The linen was cut to measure 40 cm X 183 cm. I used coton à broder No. 16 (16 skeins), No. 30 (5 skeins), and Anchor embroidery floss No. 888 (1 skein). Tall bands alternate with small bands. Examples of all pattern categories were worked – A-patterns, one-piece block patterns, two-piece block patterns, two-piece block patterns with spiders, mirrored patterns. 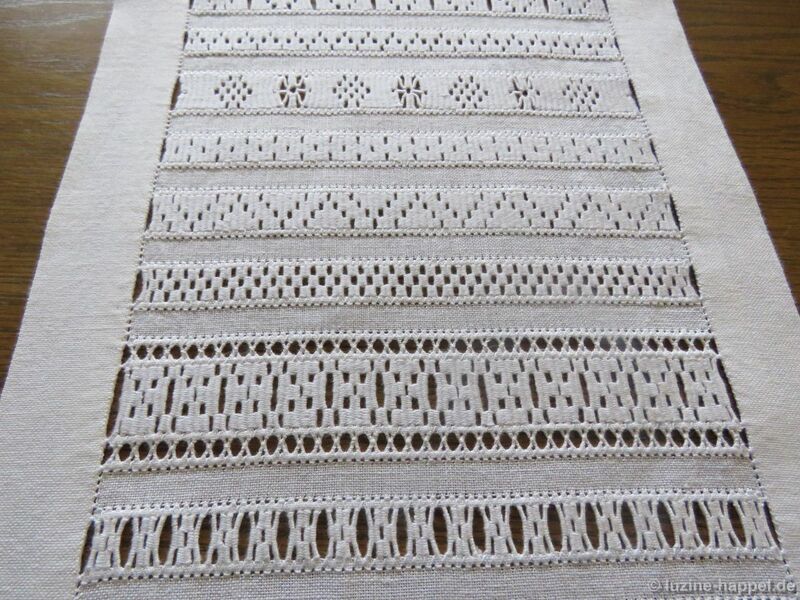 In addition divided patterns and needle weaving with wrapped bundles patterns were embroidered. A huge collection of 193 – yes, 193! 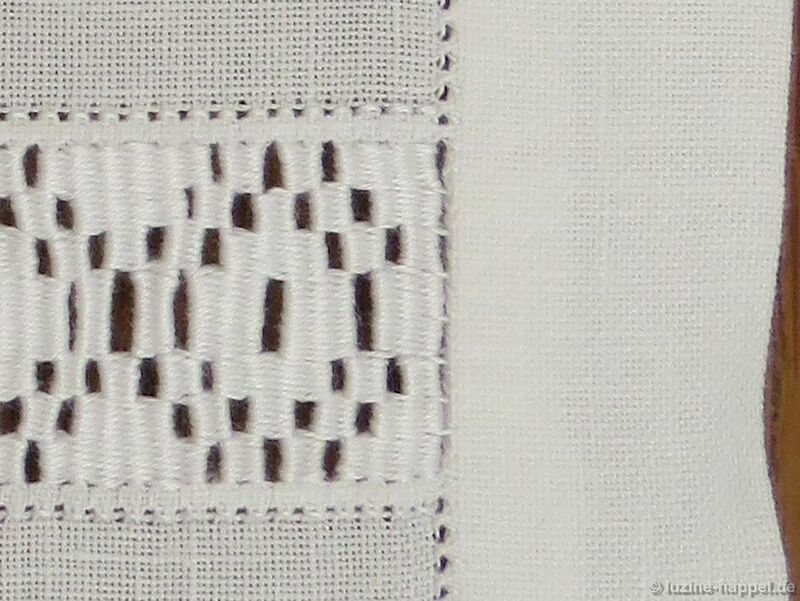 – beautiful patterns are found in my book Schwalm Needle-Weaving Bands (coming soon). All needle-weaving bands were worked over seventy-two bundles. It is advisable to choose a 72 (or a divisor or multiple of 72) bundle section for a band sampler because 72 is divisible without a remainder by many numbers, namely 2, 3, 4, 6, 8, 9, 12, 18, 24, 36. So, all one-piece block, all mirrored, and all divided patterns that have segments with these bundle numbers can be worked easily. The bands were worked up to the hem, and the cut thread ends are hidden in the hem. 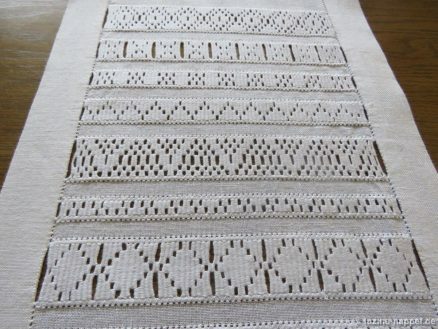 If the large gaps at the band ends – established in the course of needle weaving the pattern – are too obtrusive, they can be closed with small stitches meeting the level of the units from the back after the hemming is finished. 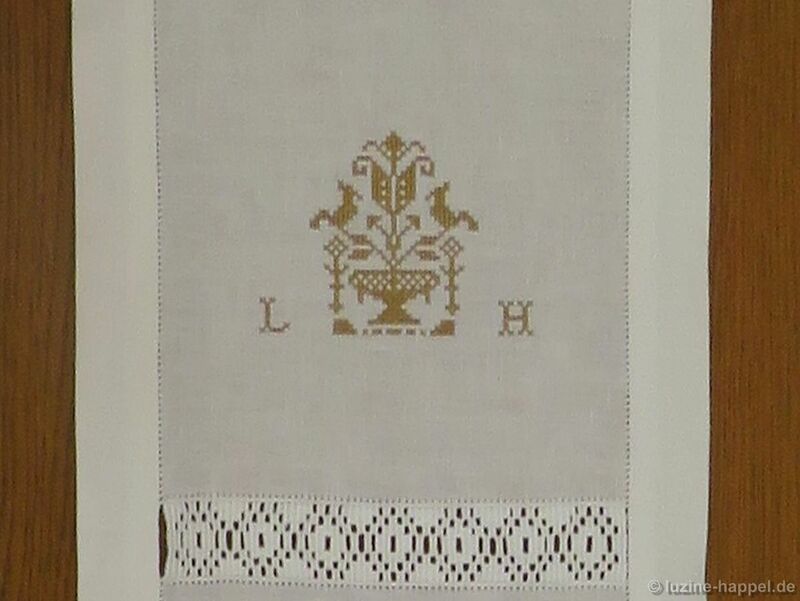 A Cross stitch crown and initials were stitched in the space remaining at the top of the sampler. Crowning an elaborate piece is common in the Schwalm. 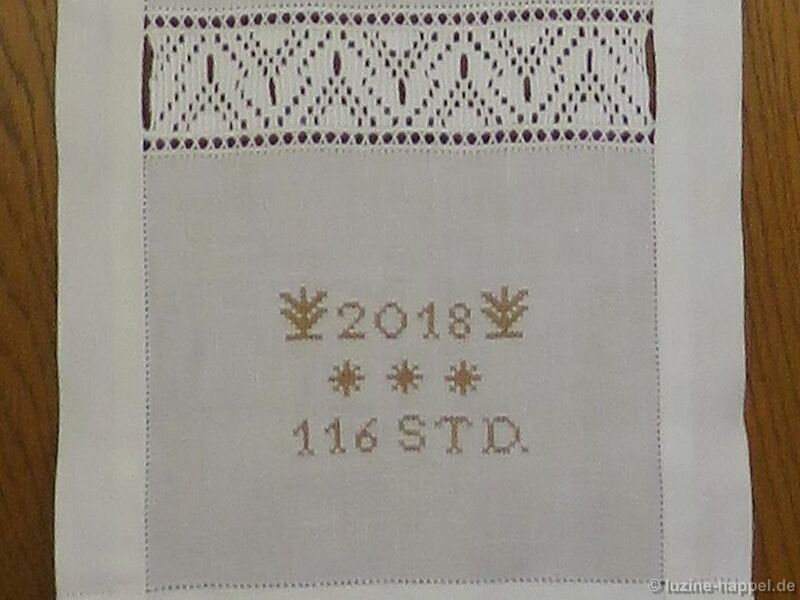 Not all linen fabrics are woven densely enough to work Satin stitch crowns (see Schwalm Crowns and Grand Schwalm Crowns), but traditional Schwalm embroidery also provides a wide range of Cross stitch crowns. 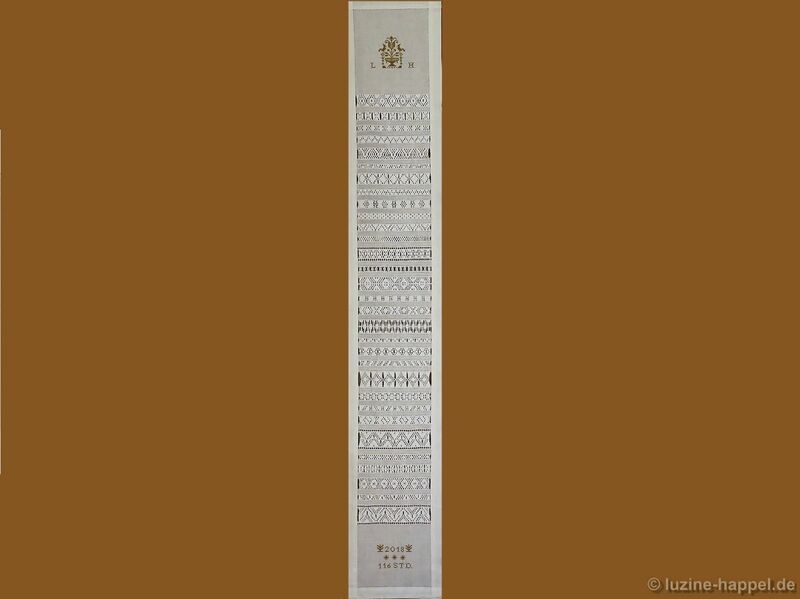 They can be found in Traditional Figural Patterns – charts for numbers, initials, birds and other animals, flowers, flowerpots, manikins, stars, ornaments, and others. The year, hours of working, and some small Cross stitch ornaments were added below the needle-weaving bands. It is always good to include the year in which a piece was worked. And it is common in the Schwalm to add small Cross stitch ornaments to numbers and letters. 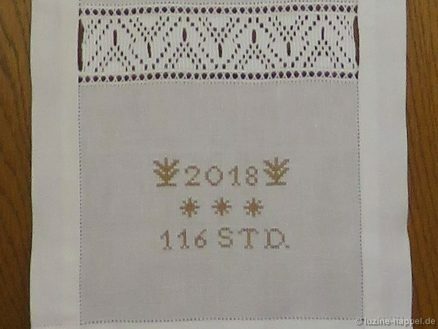 I think it is also good to add the approximate hours (German: Stunden, abbreviation: Std) spent doing the embroidery. 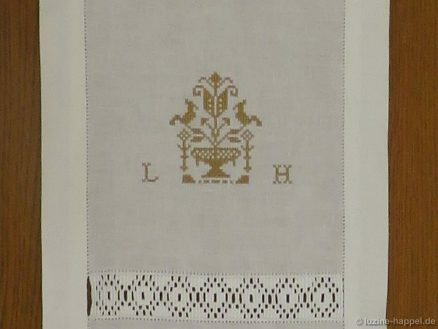 It is useful to the embroiderer when looking to the piece years later and can help people (now or in the future) understand its complexity and perhaps rate its value. Even keeping the option open to cut the linen shorter at any time, I at first thought myself crazy to start such an elaborate piece with the goal to finish it within a few weeks. But after embroidering the first few bands, it was like an addiction. Every free minute I sat down to stitch. 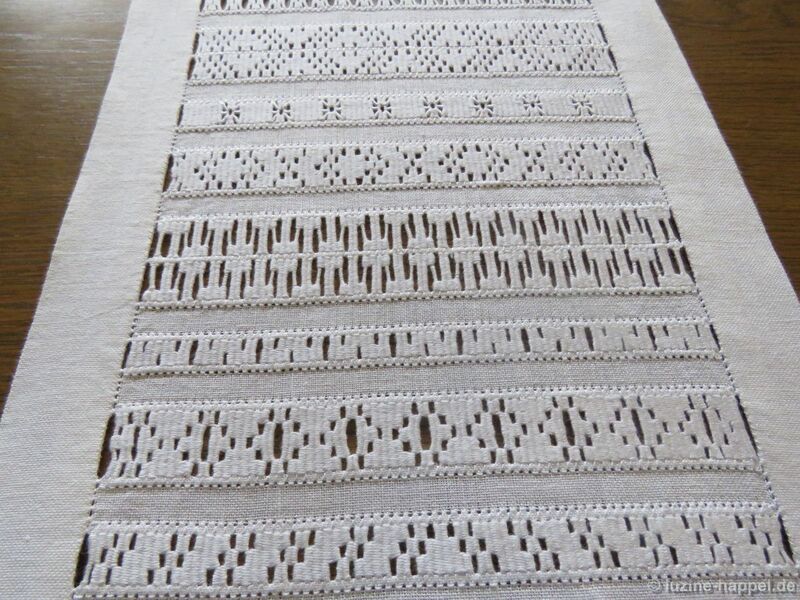 Weaving the stitches is so relaxing. 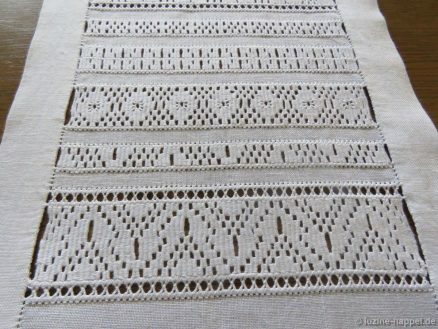 It is similar to knitting socks; I could calm down and unwind while stitching. 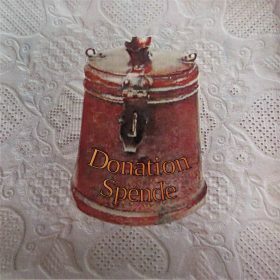 So I can recommend a needle-weaving project to all people wanting to take life at a slower pace. 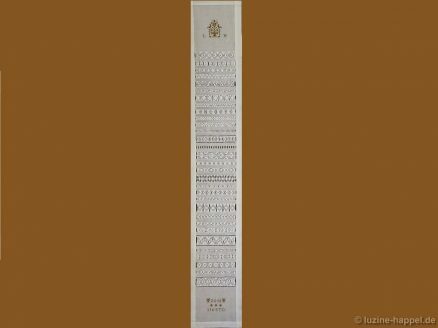 Are you interested in working such an eye-catching embroidery for your own home? Instructions, explained in great detail, for working needle-weaving bands and the different pattern categories are found in Schwalm Whitework Lesson #4 – Needle-Weaving Bands Sampler and Fancy Hems. Das Mustertuch ist wunderschön. Ein absolutes Traumstück.